For small and medium-sized companies the fit between their business processes and their Enterprise Resource Planning (ERP) system is a critical success factor. The functions and features for essential tasks must be geared to the demands and skills of the individual users. This paper reports on the usefulness of several methods for eliciting user input which served as a basis for requirements for a personalized ERP system. It describes the yield of heuristic evaluations, both by experts and by developers, and a focus group with six users representing the main user types. The focus group consisted of an identification of the most important functions, task demonstrations, and a mini design workshop. As a demonstration of the results of the various user-focused methods, some noteworthy findings on the personalization of ERP systems are presented. Enterprise Resource Planning (ERP) systems often place huge demands on their users. The wide variety of functions and features offered throughout the system often lead to systems that are far from intuitive and may hinder efficient use. Moreover, many users need only a part of the functions to fulfill their work tasks effectively. Therefore, from the perspective of a specific user, providing all the options makes the system more complicated than necessary. The usability problems which are the result of the complexity of an ERP system may be reduced by personalizing it (Benyon, 1993). Another benefit of personalization of business software is that it enables handicapped employees to function like every other employee, as it can tailor system output to cater for an employee’s special needs (Hardt & Schrepp, 2008). Personalization deals with presenting each user with tailored system output (for an elaborate discussion of personalization, see Brusilovsky (2001) or Jameson (2007)). Such output can be based upon user behavior in which case it is implicitly collected. This kind of tailoring is called adaptivity. Or the tailored output can be based upon the user wishes, needs or context which the user explicitly provided to the system. This kind of tailoring is called adaptability. A system is personalized when it includes adaptive and / or adaptable features. A personalized ERP system can, for example, provide quick links to the automatically generated reports which a user normally creates at the end of each week, and only show these links on Thursdays and Fridays. As a basis for personalization, knowledge about the users, their domain and their contexts is required. This paper reports our attempts to create this basis in a sound empirical manner, by applying a set of design-supporting, user-centered methods. The system that is the focus of this case study is an ERP system that is developed for Small and Medium-sized Enterprises (SMEs) in the metal industry; we will refer to it as M-ERP. As the development of such a system is highly dependent on the context in which it is to be used, a case study is a valuable source of information for practitioners, as well as researchers in the field of ERP system design (Yin, 2003). Our activities show that users expect that the M-ERP system would benefit from tailored output and it demonstrates how to approach personalization in a re-design process. In order to create a basis for the personalization effort, we concentrated on the requirements engineering stage in the re-design of the M-ERP system. ERP systems are mostly Commercial-off-the-Shelf (COTS) systems. The investment that is needed for fine-tuning such COTS systems is often the reason that implementation budgets are exceeded (Scheer & Habermann, 2000). Fine-tuning of COTS systems can be done by configuration or customization. Configuration deals with adjusting system parameters and user rights. Customization, in this domain, focuses on changing the package code (Light, 2005). Vendors and buyers of ERP systems are hesitant to customize because of high development and maintenance costs and the high risks of software failure. Furthermore, every time that a new version of a customized ERP is installed, it needs to be customized again. As a result, most organizations purchase COTS systems and only configure those (Brehm et al., 2001). Configuration is focused on business processes and not on the individuals executing the business processes or their specific tasks. 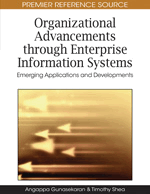 The fit between business processes and the ERP system has been identified as the most important success factor for SMEs (Everdingen et al., 2000), but a lack of focus on the individual may result in a disparity between the configured system’s functions and the user’s perceptions of goals and tasks. Because of the many tasks the relatively few employees of SMEs have to perform, a fit between business processes and ERP system in this domain means focusing on a single user’s tasks and context. Personalization may be an approach that is particularly helpful in this case, since it may increase this fit between ERP system, tasks and context of a particular user, hence increasing user efficiency.